According to Companion Guide to Istanbul: And Around the Marmara by John Freely and Susan Glyn, there is a place on the European side of the Bosphorus in Istanbul which is so treacherous even the crabs avoid it. IN 1544 Gilles left France with a French embassy that included the king’s royal cosmographer, André Thevet d’Angoulême. Gilles seems to have spent the years 1544 to 1547 in Constantinople, gathering literary sources and investigating the physical remains of the ancient city. Out of money, in 1548 he enlisted in Suleyman’s army and joined the expedition against Persia. In 1548 he met the French ambassador to the Sublime Porte, Gabriel d’Aramon, who took Gilles with him to the Holy Land and Egypt. IN JANUARY 1550, still in d’Aramon’s company, Gilles returned to Constantinople. That same year he travelled with the ambassador back to France. Almost immediately upon his return, however, Gilles headed south to Rome. While in Rome Gilles began the work of sifting through the large number of source materials and notes that he had accumulated on the history of Constantinople. Gilles had made great progress in completing his book on Constantinople by 1555; but then, as the epitaph on his tomb tells us, he was stricken by a fever that he fought for eleven days before dying at the fourth hour on January 5, 1555. His patron Georges d’Armagnac provided for his funeral and his tomb, in the church of San Marcello in Rome. FROM HIS EPITAPH we learn that Gilles was hard at work organizing his notes for his two works on Constantinople when he died. He apparently left these incomplete; and his nephew, Antoine Gilles, then took up the task of finishing his work. This he did faithfully; and in the 1560s a string of books emerged from his stewardship. The most important for our purposes appeared in Lyon in 1561 and were Gilles’ Three Books on the Thracian Bosporus and the Topography of Constantinople and Its Antiquities in Four Books. Italica Press offers an E-book translation of Gyllius here. The illustration is a 1422 map of Constantinople by a Florentine cartographer, Cristoforo Buondelmonte. Form the dough into a log or logs (one or two long rectangles, depending on how long you want the biscotti to be) and bake on parchment paper at 325 for 2o minutes. Allow to cool for a half hour. Reduce oven to 275. 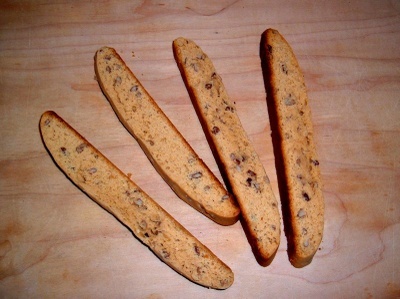 Slice log crosswise into biscotti and bake for 20 minutes (ten on each side). Watch these carefully. The baking times may vary. Especially -- don't let them get too brown on the bottom. This is the perfect banana bread. I've never even considered trying another recipe. Bake at 350 about one hour. The time will vary depending on how big the bananas are, how big the eggs are, etc. Just keep baking till a cake tester or knife comes out clean. Check out Scott's recipe here. A Montreal writer set to publish a book on Inuit oral chronicles from the era of Arctic exploration says she's gathered a "hitherto unreported" account of a British ship wintering in 1850 in the Royal Geographical Society Islands -- a significant distance west of the search targets of several 19th- and 20th-century expeditions that have probed the southern Arctic Ocean for Canada's most sought-after shipwrecks. . . . The Inuit account -- passed down from 19th-century ancestors who witnessed the British expedition's failed attempt to find the Northwest Passage -- describes "an exploring vessel" that anchored off the Royal Geographical Society Islands during the winter of 1850 because "they were iced-in and had no choice." Evidence of the expedition's presence on the islands, according to Inuit oral history captured by Eber, can still be seen during the summer months in greasy deposits along the shore where "the ground is soiled by rendered seal oil blubber" used by stranded crewmen to fuel fires for cooking and warmth. Rather than regularizing our spelling, who votes for bringing back the good old phlegm-hacking OOHCH sound we tossed aside so fecklessly after poor Chaucer died? Australia's top treasury official is taking five weeks leave to look after endangered wombats. Ken Henry, treasury secretary and animal conservationist, has warned that hairy-nosed wombats are "on death row". But opposition politicians - and even wombat lovers - question if now is the time to be thinking about wombats. Inflation is at a 16-year high, interest rates are up and fuel prices are rising. Mr Henry will also miss a central bank meeting. This dog was born without front legs. She gets around on a prosthesis mounted on model airplane wheels. From The Daily Mail via Rachel Lucas. Thanks, Craig. Want to keep rampaging elephants away? Find out how at Weird India. This stuff is great on homemade bread, and it's MY recipe. First, cut up six fresh apricots into chunks. Do not peel. Place in a saucepan with 1/2 - 3/4 cup sugar, 1 T brandy, a half cup of water, and 1 tsp each grated lemon and orange rind. Bring to a boil. Reduce to low and cook covered for about 20 minutes. Remove lid and simmer, stirring constantly, until you reach desired consistency (i.e., get rid of the excess water). 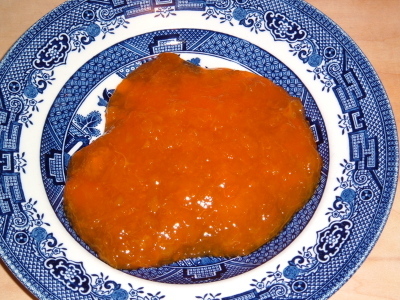 This is a very tart preserve. If you want it sweeter, add more sugar. Or eat a miracle fruit first. And don't bother to can it. Just keep it in the fridge, and watch it disappear.